I am a sculptor who gives form and voice to lived experience. I use any media necessary for my content, as I explore processes of translation and transformation: from inner state to outer form, from two dimensions to three dimensions and back again, from constraint and constriction to expansion and comprehension. I'm a topologist, engaging in careful, but ultimately incomplete, translation. I’m a cartographer, mapping territories of discovery and loss and tracing the trajectories of dreams. Mapping Nebraska is fueled by my longing for a sense of place and my frustration at my ignorance of where I live. I want to locate myself in a literal way by understanding the state where I live. In the process, I am grappling with long-standing concerns in my art: how to translate from two dimensions to three dimensions and back again; how a terrain can be at once physical, cultural and emotional; how we fabricate our identity, history, and understanding of the world; and how the digital (pixels) can inform and be informed by the digital (the work of the hand). My intention is to contrast the abstract knowledge obtained by mapping with the experiential knowledge obtained by standing on the same ground. My maps are translations and like all translations, something is both lost and gained. Absolute completeness and total accuracy are beyond my capabilities. But I can aim for fidelity, for truthfulness, and for a visceral connection between how boundaries and contours look on the map and how it feels to journey over and through rolling hills and waving grasses. I hope that my work will appeal to Nebraskans and to others living on the Great Plains as well as to anyone who has lost or found or is searching for a sense of place. Section numbers are blind stamped and embroidered in Braille and the squares are stitched together to form a 15 foot wide Locator Map so that I, and the viewer, can see, and comprehend, the state as a whole. The scale of the Locator Map is 1 inch = 2.75 miles. The Surveys. 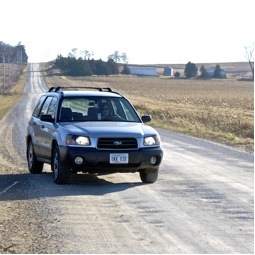 While I was drawing, I began to travel, on state highways and gravel roads, to each of these 95 sections, and to archive what I see and sense in “Surveys,” on-the-ground documentation using both a still camera and a dash-mounted FLIP video camera. To date I’ve traveled 5,000 miles and visited more than two-thirds of my 95 sections. I want to contrast the information I get from these radically different ways of seeing, knowing and imaging and communicate these differences to the viewer. In turn, I want to elicit the viewer’s own responses to the landscape and incorporate these into the project, so that this collaborative reciprocity completes the work. The Terrain Squares. Once the Locator Map was complete, and as my travels continued, I began stitching the “Terrain Squares” (quilted relief forms of selected locations) using topographic software to be able to see the area at a much larger scale (1” = 596 ft) than the Locator Map. At this scale, boundaries are lost and only topography remains, with heights and depths expressed as contour lines and padded relief forms. I describe this physical topography with stitching, using, but extending, conventions of quilting and embroidery. I stitch with the same vocabulary I use when drawing: contour lines and eccentric hatching and a sort of scumbling—decorative, but not too decorative—for the lakes and rivers. My stitched lines meander, losing course and then regaining it. They carve through the height of the quilted stuffing, containing and bounding it. Lakes and their surrounding land are subdued through hatching. When I stitch the blue water, the only patches of color in the squares, I imagine the actions of the wind on its surface and the effects of its currents on what lies underneath. The gray backs of the Terrain squares contain fragments of a hand-stenciled white graphic of Nebraska grasses, shown much larger than life size. These “ghost grasses,” filtered through memory and distant from botany, provide a vertical and organic counterpoint to the horizontal geometry of the quilted terrain. The blue of the water appears white on the reverse, forming “ghost lakes” and “ghost rivers” which combine with the stenciled grasses and with the stitched lines in unexpected and unpredictable ways. The liveliness of the resulting found compositions contrasts with the rigid accuracy of the Locator maps. The Terrain Squares fasten together in any order desired with a system of buttons and tabs which echo the grid markings of my drawn Locator Map. Stamped symbols on the Locator Map show the specific location of each Terrain square. The Ground Cloths. As I continue to stitch and to traverse the physical terrain I am also making mixed media “Ground Cloths” which incorporate surface design techniques such as screen printing, foiling and hand dying as well as hand and machine stitching. These textile constructions respond to a particular location, documenting what is unseen, invisible, remembered or imagined, without rigid classifications, preconceptions, rules or systems.